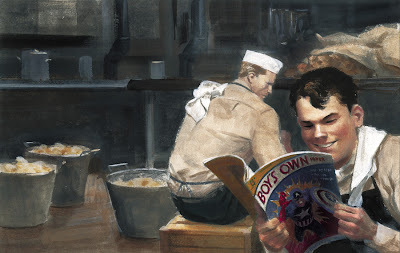 In this page from Mythos: Captain America, I portray both Captain America and his soon-to-be sidekick Bucky Barnes. Bucky's face is based on my former intern, Orpheus, who was kind enough to send me turnarounds of his head. 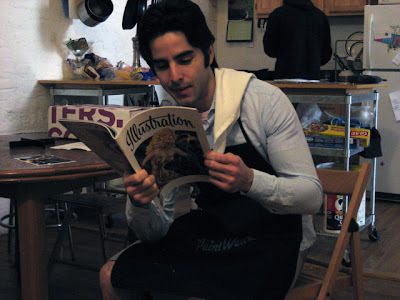 You may also notice I'm holding my favorite magazine, Illustration. Buy it! It's awesome. You've mentioned interns before and I've always been curious about just what chores an intern would be able to handle for an illustrator....or is it more of a mentoring thing? I didn't really want an intern at first, but Orpheus and his professor, Jose Villarubia, convinced me that I did. For the most part, he cut down paper and colored in my sketches. Other than that, he just helped me with anything that could save me time. Nowadays, he does flats over my inks, which is all done over ftp and e-mail.